First black to represent N.C. in U.S. Congress, 1875-1877; state senator, 1868-1874. Home is one block west. The first black member of Congress was a native of North Carolina, Hiram R. Revels, elected from Mississippi to fill Jefferson Davis’s Senate seat in 1870. 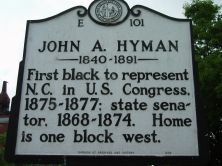 The first African American to represent North Carolina in the Congress was John A. Hyman (1840-1891), a native of Warren County, elected from the state’s “Black Second” in 1874. 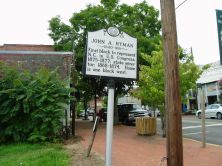 Legend has it that Hyman, born into slavery in 1840, as a boy was befriended by a Mr. King, a Northern-born Warrenton jeweler. King’s neighbors took offense and ran the aging shopkeeper out of town. Hyman was sold and sent to Alabama but made his way back home at the close of the war. With an aptitude for public speaking and politicking, young Hyman became a delegate to the second state Freedman’s Convention in 1866, to the first Republican state convention in 1867, and to the state Constitutional Convention in 1868. In that same year he commenced the first of several terms in the state senate. His tenure in that body was clouded by involvement in frauds and payoffs, including the Littlefield-Swepson railroad bond scandal. Hyman was defeated in his first run for Congress in 1872. Two years later he was elected, but in 1876 he failed to obtain his party’s nomination. During his single term Hyman supported legislation to secure and protect civil rights, especially suffrage privileges. In Warrenton Hyman farmed and operated a grocery store. He was constantly in debt, being forced in 1878 to dispose of all his real estate. The following year he was accused of embezzling funds from the Methodist Church. Around 1880 Hyman left North Carolina for Washington, D.C., where he worked as an assistant mail clerk. He died and was buried in the Nation’s capital.